Today is Gauda Prime Day 2013. 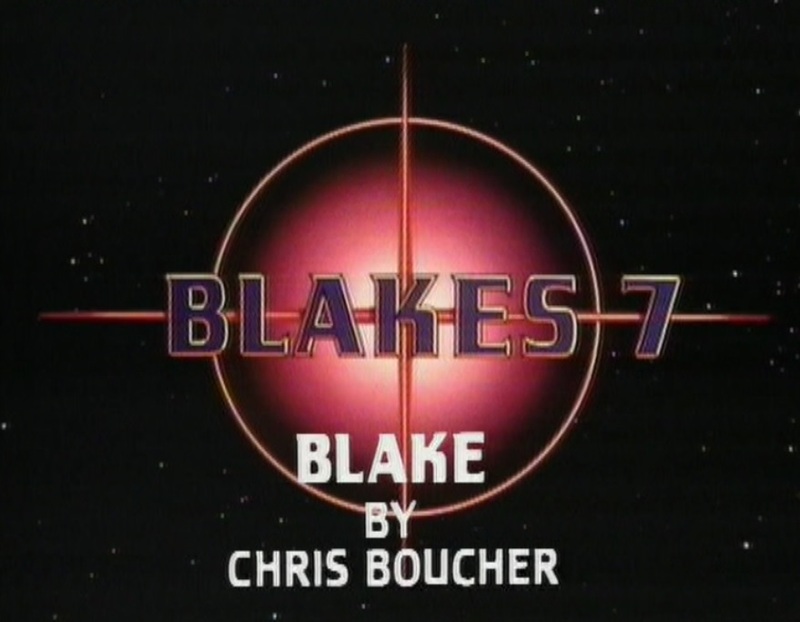 It’s the anniversary of the first broadcast of “Blake,” the finale to season D of Blake’s 7 over three decades ago. I wrote in a previous blog post about how I got to see that episode being recorded at BBC Television Centre in 1981. This new post follows on from that — as my pals Peter, Tony and I left the studio floor and were shown by producer Vere Lorrimer up a flight of metal steps, not unlike a fire escape outside a building, and to the production gallery. En route, we saw a small room where images from the studio cameras were monitored to check the quality of all the images being recorded, and where adjustments could be made if necessary. Beyond this was the main production gallery where the director, vision mixer, and director’s assistant behind a further row of TV monitors and control panels that would put the Scorpio to shame. A large glass window in front of that overlooked the studio, though the lighting rig and the backs of various sets made it impossible to see the whole of the studio. They relied on monitor images, from the TV cameras on the studio floor, to see what was happening. Once the recording started, it was disorienting to see the erratic, abrupt images on the smaller monochrome monitors relayed the feeds as the cameras moved into position between shots. The principal image, the one that would be recorded “as live,” was larger and in colour. The final rooms we were shown through were the sound mixing area and a smaller space where the computer graphics were generated for the in-studio display screens. For the recording, we were allowed to sit in the Producer’s both. This contained a TV screen that displayed the image being recorded, and also an audio feed that combined the sound from on-set and from the director in the production gallery. This meant we could chat to each other as things went on, while not disturbing the production team who were the other side of the glass window from us, only four feet away. Vere Lorrimer left us to watch the rest of the studio session, while he returned to the production gallery and his seat behind director Mary Ridge. Occasionally, the production associate Frank Pendlebury would drop in to use the phone on the desk in front of us. He seemed to be quite concerned about some missing videos. Every time he came in, he was polite and apologetic about disturbing us. This was characteristic of the courtesy we were shown by everyone at the BBC during our visit. As we watched the continuous output on our TV monitor, we saw the first scene of the session being recorded. This was the one in the forest hut, where Vila, Dayna and Soolin take refuge for the night. Vere Lorrimer had warned us that the necessity to try scenes over and over again might seem boring. But with so much to see as the programme progressed, whether scenes actually being played or the director correcting and adjusting little items, there never seemed to be a dull moment. We could see and hear everything that director Mary Ridge could see and hear, even between scenes as lights were altered and cameras focused and refocused on the actors. Vila, Dayna and Soolin burst into the hut, but something is not quite right with their entry, and Mary Ridge has the scene done twice again. each time, the planks have to be put back over the door, and then crashed down as the trio smash their way in. Before this, however, there is a slow circular look by one camera around the stove so that we can see the hut and appreciate the quietness of the scene before their arrival. Then, when finally in at the door, Glynis Barber (Soolin) is not visible because the “shafts” created by the lighting people to give the impression of a broken roof do not illuminate her face. She is realigned, and the scene is done again. The women take one side of the door each, and Vila retreats to the back of the hut. When the lights have gone, the focus is on Dayna and Solin — who find that Vila is hidden beneath the covers. Then it’s back to the less hurried direction of a conversation as Dayna and Vila argue, and Soolin speaks her penultimate line (“you have to assume everyone is out to get you). We cut to Vila grinning (“I always assume that, wherever I go”), then Soolin’s final line (“The difference is, on gauda Prime, you’ll be right”) and finally back to an unhappy Vila. The advantage of being able to see the continuous output and all the other monitors is that we could see the various other shots being set up, in the knowledge that we’d be able to see the final version on TV and were thus “missing” nothing. There was a subsequent scene in the hut. This was set up by “lighting” the prop stove with a red lamp inside it, and bringing Michael Keating a blanket for Vila to wrap himself in. All the while, production manager Henry Foster on the studio floor with the actors relayed the instructions from Mary Ridge. He was very recognisable in his navy blue jumper with HENRY in colourful capitals on the front. In this scene, the bounty hunters surprise Vila, and Avon bounds in to the rescue. It was a chance for us to admire Mary Ridge’s direction, as the number of different shots and “follow-ons” were set in motion. In the gallery, to her left, sat the director’s assistant Winifred Hopkins, calling e shot numbers as the director said “cut” to cue each camera change for the vision mixer. The guns used in most of the scenes we saw could only fire one shot without having to be reset by the special effects team. So when rehearsing a scene ahead of a recording, the actors said “bang” rather than use up the prop charge. And if a second shot was required from the same gun, the actor said “bang” for the second or subsequent one. The feeble fizz of a prop discharging was replaced in post production with an effects sound. 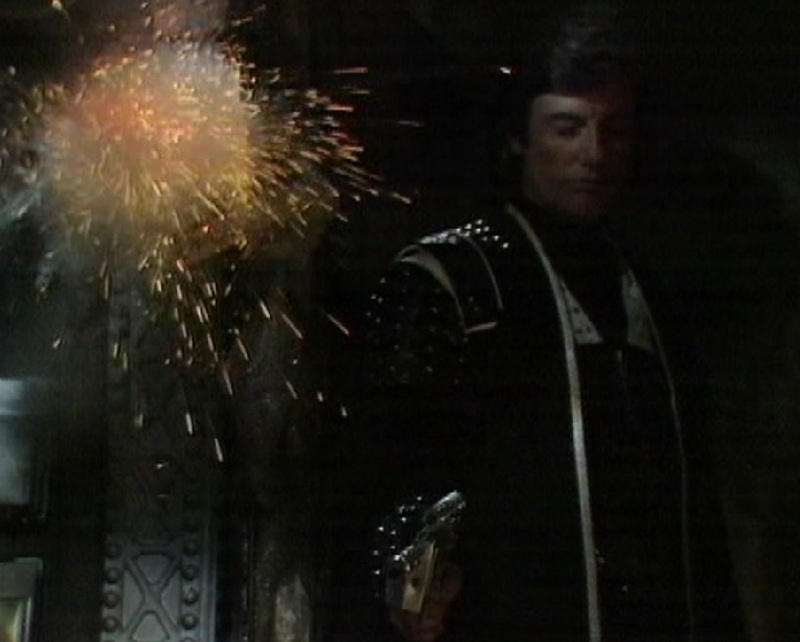 Avon (Paul Darrow) needed to kill two bounty hunters in this scene, fore example. A further effects requirement was for a charge in the set itself, when one of the bounty hunters shots at Avon but only hits the wall. 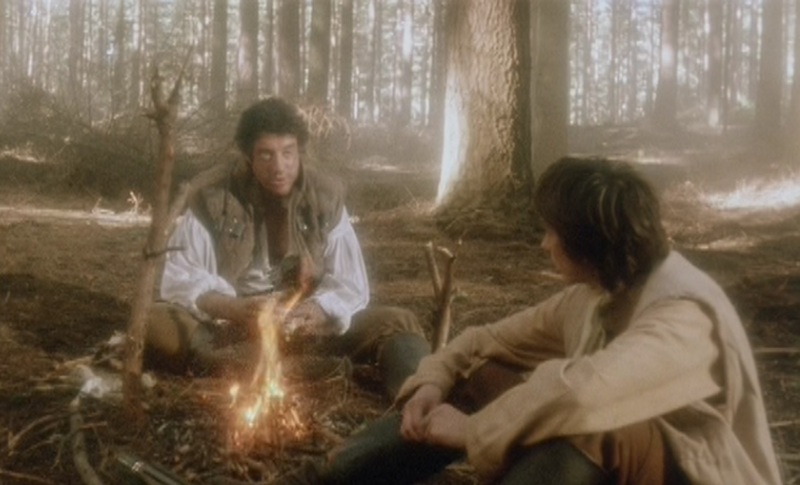 In the scene, Vila is surprised by the hunters, who prepare (rather unconvincingly, we thought) to bash Soolin and Dayna who were still sleeping. Avon comes in and disposes of one hunter, who falls down quietly. The other is more belligerent, shoots back, and is then shot. At this point, the extras had to “die” again, as their death cries had been disappointingly muted. On cue, they groaned melodramatically and (although not being recorded in vision) clutched at their stomachs. “They do try hard,” observed Mary Ridge as an aside, before telling Henry Foster to ask one for another groan. The extra dutifully provided a expiring groan. “Tell him he died beautifully,” said Mary. 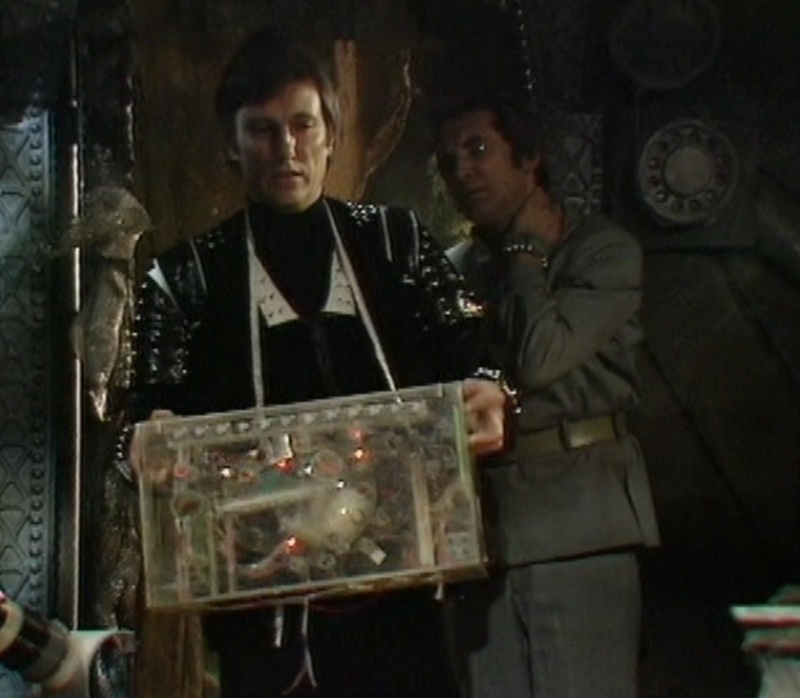 The rest of the scene was then recorded, into which Avon’s recovery of Orac (on film) would subsequently be inserted. While they set up the next sequence, we were wondering (like Vila) whether Tarrant was dead. Tony Murray was never a great Tarrant fan — despite having being on a previous set visit to see “Death-Watch” recorded, and thus having twice the Tarrant for his troubles on that occasion. So Tony was not-so-secretly relishing the thought that Tarrant had already been killed. As the set for the s the tracking gallery was readied for use, we were able to glimpse some of the film work on a monitor. 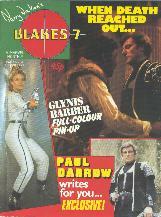 The images consisted of Blake (Gareth Thomas) chatting with a small, young woman. He held her at gunpoint, killed some men… It was an odd sequence to see, because it was edited together in a final form but we had to guess at what was happening because the film sequence was silent. And it slowly dawned on us that Blake had a remarkable scar across his left eye. At this point, Vere Lorrimer dropped in again to suggest that we grab something to eat. So we went down to a snack bar and bought coffee and biscuits (the student idea of a nourishing meal). I phoned the Marvel office, in the hope of reaching Stewart Wales (the editor of Blake’7 Monthly who we had failed to meet earlier in the day). This was in the days before mobile phones, so it meant feeding ten pence pieces into a pay phone half-concealed with a plastic sound-muffling cowl. Alas, Stewart was still in his conference meeting, and so we returned to the Producer’s booth. Our whole trip had been set up by Vere Lorrimer as a courtesy to Blake’s 7 Monthly, for whom we were hoping to provide the same kind of writing services that our friend Jeremy Bentham had been doing so admirably for the longer-established Doctor Who Monthly. When he heard that we’d been unable to reach Stewart by phone, Vere Lorrimer thoughtfully arranged for us to meet Ken Armstrong, a photographer working for Marvel who was in the studio that day taking photographs of the episode. We had a chat with Ken about the ideas we had prepared for Stewart Wales. We thought we might write detailed synopses of the episodes. “Not a good idea,” said Ken. We suggested we could review stories. “Not a good idea,” said Ken. Write comic strips? “Not a good idea,” said Ken. All our finely wrought creative ideas seemed to appeal to him as much as if we had presented him with a cup of cold vomit. Everything was “Not a good idea.” He may as well have had a card printed with those four words on it. Thus we saw before us, in Ken, an insurmountable obstacle to contributing anything interesting or meaningful to Blake’s 7 Monthly. It wasn’t at all the way we thought we had already been able to excite the editor’s attention — and earned a trip to the BBC Television Centre in preparation for that. I suppose, to be fair to Ken, he did write for the magazine, and may even have been deputy editor. So he probably saw before him, in us, three spotty oiks who wanted to pinch all his work on the publication. Or maybe he’d already seen the writing on the wall, because of the events in this episode, “Blake.” Because while making our phone call and eating our biscuits in the coffee area, we had seen a group of extras dressed in Federation Trooper costumes. But not yet made the connection. More about that in my next blog about this studio visit. Thanks for that, Peter. It’s a fascinating look behind the scenes of the episode – and amazing that they would let fans in for the cliffhanger episode, even if they thought at the time that it was the end of season and not the end of show. Thank you for sharing your memories, especially on this day.